Every gadget freak knows of them, and usually despises them. Yes, extended warranties. Every Sam, Joe and Bob salesman at your favorite consumer electronics store is trying to hock one to you. The Washington Post took a very in-depth look at extended warranties, the numbers, and what they mean for the consumer. 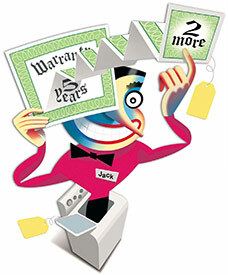 Warranty Week, an industry publication, last year estimated that of the $15 billion in premiums charged consumers in 2004, $7.5 billion went straight into the pockets of the stores that sell warranties as their cut. This is an excellent read for anyone who has purchased, or even been haggled into buying an extended warranty. Hit the jump to let us know what you think of extended warranties, find the linkage to the Washington Post article and vote in our poll about extended warranties.